Connie Kieltyka I have worked with families giving birth for more than 20 years. I know that pregnancy and birth can be a truly sacred and joyful event for everyone involved. Olivebridge Midwifery is dedicated to making this possible, offering the exceptional level of personal care and individual support that a qualified midwife can provide. I believe women should have the option of giving birth where they feel safe and most comfortable, whether that be their home, birth center, or a hospital. I became a homebirth midwife so that women can have the option of birthing at home with a professional to guide them for a safe, gentle, healthy birth. Before founding Olivebridge Midwifery, I was a midwife on staff at St Peter’s Hospital in Albany catching babies and providing gynecological and obstetric services in two health clinics and a private office. Prior to that, I worked as a midwife at St Luke’s Hospital in Newburgh. I have experience with working with high and low risk mothers. 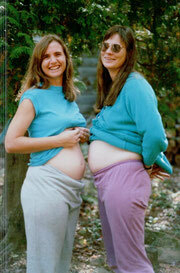 While in midwifery school I worked as an RN at the Neugarten Birthing Center in Rhinebeck for over six years. I have also worked as an RN in medical surgery and detox at Benedictine Hospital in Kingston. As I was studying for my RN degree, I worked as a Midwife Assistant on staff at the Peekskill Birth Center. I am a Certified Childbirth Educator and doula and have provided labor support and postpartum care for homebirths, birth centers and hospitals in Westchester, Dutchess and Ulster counties. I bring an integrative medical approach to my practice and incorporate herbal remedies, nutritional healing, breastfeeding techniques and advanced skills in labor and birth support. My experience extends to women of all ages, styles of life and cultural backgrounds. I am dedicated to treating every woman as an unique individual with her own needs and requirements. Together we will find the methods and remedies that are right for you. I was born into a large family and have happy childhood memories of helping my mother care for my younger brother and sister as newborns, changing their diapers, watching her breastfeed, and rocking them to sleep. As an adventurous young woman, I traveled widely throughout the world, built a cabin, learned to grow organic vegetables and to use herbs medicinally. I began practicing yoga and meditation. I also worked for a number of years in radio, film and sound engineering, where I met my husband. During this time, I began to study midwifery and it became clear to me that the homebirth model required being available for others 24/7, and at that time, I decided to work in the hospital setting with a schedule, while raising my own children. Our two sons were joyfully born at home. My midwives and doula guided me through the fears and strong feelings that arise throughout the prenatal period as well as through labor and birth. As we raised our family in Olivebridge, I continued to study midwifery while also taking courses in alternative approaches to promote fertility and enhance prenatal, labor, and postpartum care. I am an Arvigo massage practitioner. Now, as my sons reach adulthood, I am able to devote myself to providing what is needed throughout all phases of the birth experience – and through all stages of being a women. Giving the careful attention all women deserve.